The 2014 Chevrolet Equinox competes against 5-passenger compact crossover SUVs like the Honda CR-V, Toyota RAV4 and Ford Escape, but its larger dimensions make it feel more substantial. Though nearly a foot longer than some rivals, the Equinox trails in cargo space. Its better aspects include a roomy rear seat, quiet ride, and commendable towing capacity with its optional V6 engine. It is the perfect crossover for me, after driving a full size SUV for years. I love my Equinox. Perfect size since my children are grown, my son still drives the full size SUV GMC Yukon I drove when he was young. Very comfortable leather seats. Roomy, sits 4 very nice. I like the in dash navigation, music and Bluetooth. It has all the options I was looking for. I love the hatch opening, opens so easily with a one touch button. The key less entry is so handy as is the lock and alarm. The sound system is amazing and so simple to use. I really like the Bluetooth and the ability to answer my cell phone with one button on the steering wheel. The only downfall. I am short. I find I have several blind spots. Most noted is taking a left hand turn and the rear view is blocking my view. The other blind spots are resolved with the backup cam. Spend less on gas but get all the zip and comfort of an expensive SUV! I have had my car for 2 years now and I still love it as much as the day I bought it! It is fun to drive, it has zip and has some get up and go for a 2 cylinder. It has the option to use eco and save your gas or regular. I always use eco and I get about 28 city and 30+ highway! It is very comfortable for short trips or long trips. I have taken my family on a 13 hour trip and everyone was very comfortable in the front and back seats. I also have XM radio in it and now I cannot live without it! I love the hands free option for changing channel and the volume. I can also connect my phone to the car by Bluetooth and answer my calls hands free which is much safer then holding your phone while driving. My only complaint is that I didn't buy a newer Equinox! 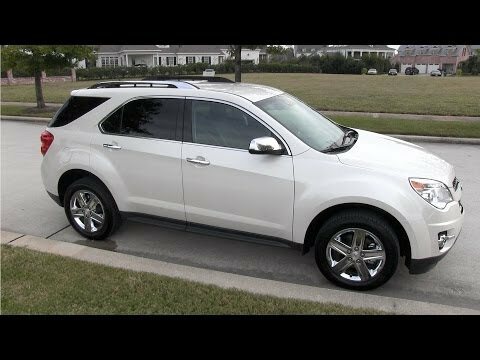 Our Chevy Equinox LT is a nice SUV that's great for traveling and shopping. With great smart car features. But not very spacious to sit in for plus size people with big families. The performance is great navigation is fine. Very reliable and great for traveling. The comfort is not that great because it's not spacious enough for our big family. Sometimes it get really cramped and the car holds a lot of heat during the summer. However it's great for big grocery shopping. The features are awesome when it comes to OnStar,Satellite radio, Bluetooth and automatic start with your key. The radiator been replaced once, battery been replaced once, thermostat went once, few other issues after battery was replaced and the stability track act up sometimes. It ok on gas must of the and sometimes the panel is a little off and blind spots in the back. The back up cam is ok but gets blurry in rainy foggy weather.